Kyla Farrow is a movement educator, artist, dancer, and fitness professional. She has a BFA in Dance and is a PMA® Certified Pilates Teacher and an ACE certified personal trainer dedicated to helping people find their strength and vitality so that they can continue to do what they love. For the past decade she has been working with individuals of all ages and abilities. 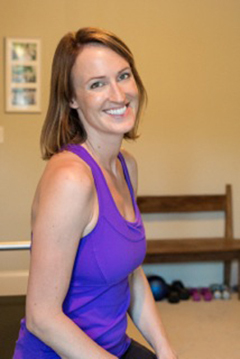 Kyla is fully trained in the Pilates method (STOTT & The Pilates Center), and has also studied kinesthesiology, anatomy, nutrition, psychology, and restorative yoga. Whenever she can, she furthers her knowledge with continuing education in a wide range of health, wellness, and Pilates specialties. Kyla enjoys working with people of all ages who are looking to improve their quality of life, reduce pain, and feel more embodied. To schedule a session or book a class with Kyla, email or call today!